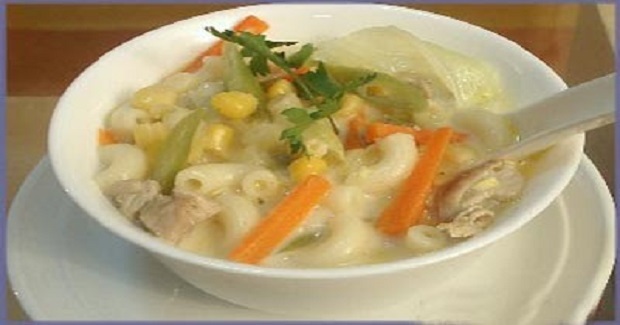 Chicken Sopas Recipe - Gutom Na! Posted on Tuesday, December 6th, 2016 at 1:04 am. Make chicken broth by puting chicken and 1 teaspoon salt in 4 cups of water. Bring to boil then to cook the chicken. When cooked, shred chicken and reserve broth for later. Heat 2 tbsp oil in a pot, saute garlic and onions then add the shredded chicken. Add 1 tsbp fish sauce and a dash of crushed pepper. Saute till chicken, is almost browned. Add the carrots and saute some more. Add 1/4 cup broth and let it simmer. Add the uncooked macaroni and mix well. Add the 3-4 cups broth that have been kept hot to the pot. (I usually heat the broth while I am sauteeing the ingredients for the sopas.). Cook until macaroni is almost done, around eight minutes or. Add the shredded cabbage and bring to a boil. At this point you may add more broth depending on your preference for a thick or thin sopas). When cabbage is cooked, add salt and pepper to taste. Remove from fire then add 1/2 cup of milk. Mix everything then it is ready to serve.